FlowMeans is method for automated identification of cell populations in flow cytometry data based on K-means clustering. The FlowMeans algorithm utilizes the R statistical computing environment and is implemented in FlowJo 10.1r7 as a plugin accessible from the Plugins menu (Workspace tab –> Populations band). If you have never used a FlowJo Plugin, please see the Installing Plugins page for detailed information on plugin and R setup before continuing. Open FlowJo v10.1r7 or later. If using an earlier version of FlowJo, please download and install the latest release for Mac or Windows, before proceeding. The FlowMeans plugin is included with the installation package. 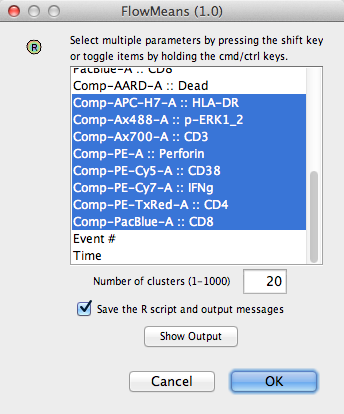 Load some cytometry data files (ex. FCS or LMD) into your FlowJo workspace, then Save the workspace. 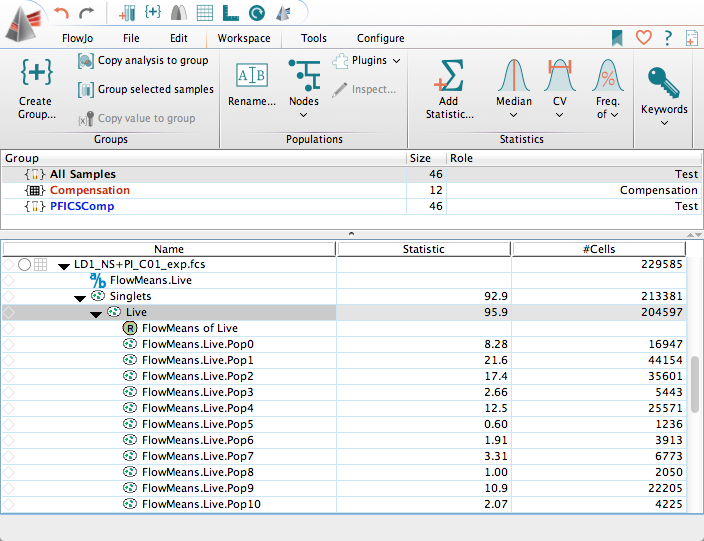 Select/highlight a sample or gated population node within the samples pane of the FlowJo workspace. Initiate the plugin by clicking on the FlowMeans menu item, located in the Plugins menu (Workspace tab –> Populations band–>Plugins). 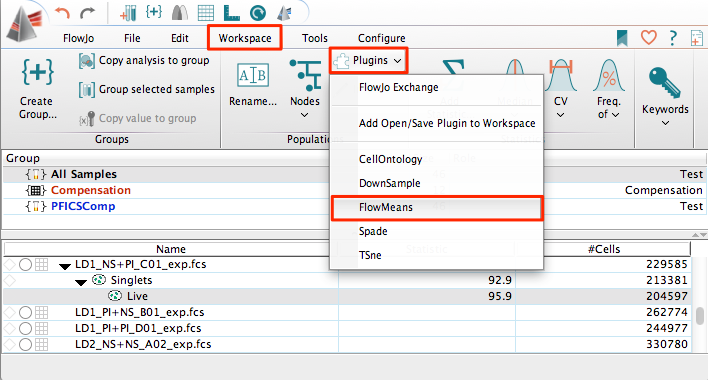 A new FlowMeans dialog window will open, prompting you to select the parameters to be used for clustering, and specify the number of cluster populations that will be produced. To initiate the FlowMeans calculation, click OK. The algorithm will run and return gated populations containing the events for each cluster. Aghaeepour, N. et. al. (2011) Rapid cell population identification in flow cytometry data. Cytometry A, DOI: 10.1002/cyto.a.21007. PubMed Link.